The Ambassadors and St Martin's Theatres were designed by the architect W.G.R. Sprague with building works starting in 1913. World War I interrupted the construction of St Martin’s for three years and the Ambassadors was built with the intention of being an intimate, smaller theatre. It has a humble facade with balustrade decorated with ball-shaped ornaments and is situated opposite the famous Ivy Restaurant which is a favourite haunt of the theatrical elite. The Ambassadors Theatre has housed many productions with Agatha Christie's infamous play, the Mousetrap, opening there in November 1952. With one of the longest runs in West End history, it transferred to St Martin’s theatre after over 21 successful years there. 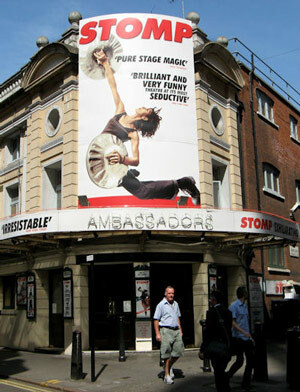 When the Ambassadors Theatre Group took over in 1999 it was renamed the New Ambassadors. The Masterpark Newport Place. This theatre participates in the Theatreland Parking Scheme - find out more about the great discounts offered by clicking on the link. Induction Loop Necklace: suitable for persons wearing a hearing aid. The induction loop is worn around the neck and your hearing aid needs to be switched to the ‘T’ setting. The loop has adjustable volume control. Headset: This device amplifies the sound through earpieces similar to headphones. Suitable for persons without hearing aids. You will be asked for a £10.00 deposit on collection of the equipment, which will be fully refunded after the performance by a member of the front of house staff. Due to space restriction only able to accommodate wheelchair transfers into seats (which have armrests).